2. What type of network must a home user access in order to do online shopping? They are the primary source and providers of information and services to end devices. They form the interface between the human network and the underlying communication network. They direct data along alternate pathways when there is a link failure. They run applications that support collaboration for business. They filter the flow of data, based on security settings. 4. Fill in the blank. The acronym (BYOD, byod) refers to the trend of end users being able to use their personal devices to access the business network and resources. 5. Which description correctly defines a converged network? Match each characteristic to its corresponding internet conectivity type. 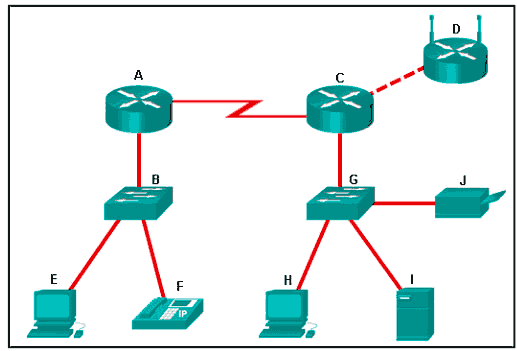 Match the form of network communication with its description. 9. Which statement describes a characteristic of cloud computing? Applications can be accessed over the Internet through a subscription. 11. What is a characteristic of circuit-switched networks? A single message can be broken into multiple message blocks that are transmitted through multiple circuits simultaneously. If all circuits are busy, a new call cannot be placed. If a circuit fails, the call will be forwarded on a new path. Circuit-switched networks can dynamically learn and use redundant circuits. 12. Requiring strong, complex passwords is a practice that supports which network security goal? 14. Which statement describes a network that supports QoS? Data sent over the network is not altered in transmission. The fewest possible devices are affected by a failure. The network provides predictable levels of service to different types of traffic. The network should be able to expand to keep up with user demand. Refer to the exhibit. Which set of devices contains only intermediary devices? 16. Which device performs the function of determining the path that messages should take through internetworks? 17. Which tool provides real-time video and audio communication over the Internet so that businesses can conduct corporate meetings with participants from several remote locations? Both LANs and WANs connect end devices. .
WANs are typically operated through multiple ISPs, but LANs are typically operated by single organizations or individuals. WANs connect LANs at slower speed bandwidth than LANs connect their internal end devices. The Internet is a WAN. 20. Which area of the network would a college IT staff most likely have to redesign as a direct result of many students bringing their own tablets and smartphones to school to access school resources? 21. Which expression accurately defines the term congestion? 23. Which term describes the state of a network when the demand on the network resources exceeds the available capacity? 27. An employee at a branch office is creating a quote for a customer. In order to do this, the employee needs to access confidential pricing information from internal servers at the Head Office. What type of network would the employee access? 29. What type of network traffic requires QoS? 30. Which expression accurately defines the term bandwidth? 31. A network administrator is implementing a policy that requires strong, complex passwords. Which data protection goal does this policy support? 32. Which statement describes the use of powerline networking technology? 33. What security violation would cause the most amount of damage to the life of a home user? A (converged) network is capable of delivering voice, video, text, and graphics over the same communication channels. 36. Fill in the blank. The acronym (byod, BYOD) refers to the policy that allows employees to use their personal devices in the business office to access the network and other resources. The questions are really good.